Any issues, concerns or problems you may have with your Remington V3 Autoloader; this is a thread for troubleshooting. Love my new V3. It is my first auto-loading shotgun, so not sure what to expect as far as wear on the moving parts. Barrel and receiver were cleaned out of the box per the manual, although I did not disassemble the bolt at that time. After 100 target rounds plus a dozen or so various hunting rounds to pattern test the choke tubes, I fully disassembled the action for cleaning per the manual, including the gas pistons and bolt assembly. I was surprised to see obvious wear on the bolt carrier assembly already. 1) On the cam pin where it slides against the bolt head cam. This looks the worst and is my primary concern -- at the edge of the wear area the metal has been pushed up enough to catch a fingernail. 2) Where the bolt carrier blocker strikes (less concerning). I will attempt to attach a photo with these points circled. 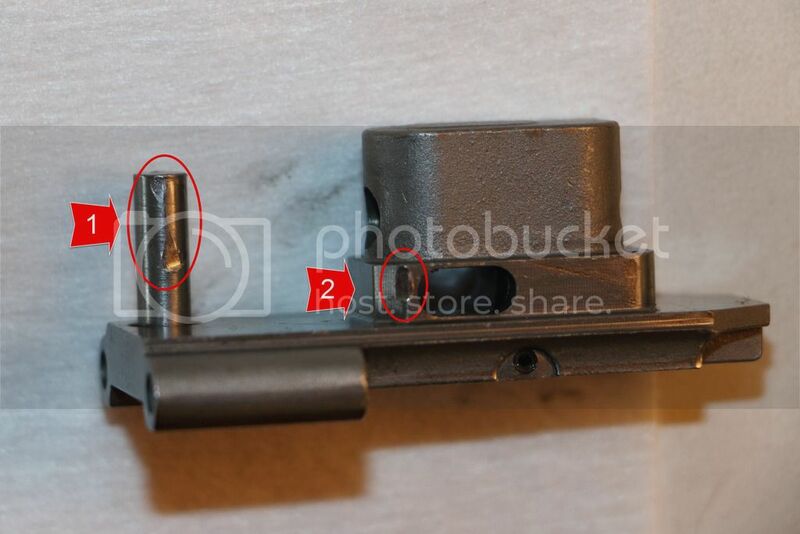 A call to Remington customer service was somewhat reassuring that "some wear on the cam pin is normal", and bottom line call back if the gun malfunctions. And operation so far has been flawless, without a single failure to cycle anything from 2.75" 1 oz target loads to 3" high speed waterfowl loads, as promised by the V3 promotional material. Just not sure if these wear points on the bolt carrier are normal break-in or the start of something bad that will progressively get worse. I am tempted to clean up the cam pin with some fine sanding, but have not since this could be an unauthorized repair that would void the warranty. Reassembling, I lubricated the cam pin with a light gun grease as indicated in the manual and then the remaining parts of the bolt assembly with Rem-oil. I'll continue to shoot and see if the wear stops here or progresses. Has anyone else seen similar wear on the cam pin? To answer your question...that wear on the cam pin does look excessive to me for a new firearm. I know that on some 1100s/11-87s they will quickly get marks on the barrel extension from the locking block bouncing, and the gun will look almost identical 10 years later. Just watch it and see how it goes I guess. Virginian wrote: I know that on some 1100s/11-87s they will quickly get marks on the barrel extension from the locking block bouncing, and the gun will look almost identical 10 years later. Just watch it and see how it goes I guess. Thanks. Good to know. I did shoot another 75 target rounds and did not see a significant change in the level of wear on these points. After reading your post I checked my V3 and it too has the same wear as yours. It could be that this part has to break in some. I had a 11--87 that had marks in the barrel lock up area, but once it got broke in they never got any worse. I will just have to check the wear from time to time. Hope this helps. Behringer wrote: Love my new V3. It is my first auto-loading shotgun, so not sure what to expect as far as wear on the moving parts. Barrel and receiver were cleaned out of the box per the manual, although I did not disassemble the bolt at that time. After 100 target rounds plus a dozen or so various hunting rounds to pattern test the choke tubes, I fully disassembled the action for cleaning per the manual, including the gas pistons and bolt assembly. I was surprised to see obvious wear on the bolt carrier assembly already. 1) On the cam pin where it slides against the bolt head cam. This looks the worst and is my primary concern -- at the edge of the wear area the metal has been pushed up enough to catch a fingernail. 2) Where the bolt carrier blocker strikes (less concerning). I will attempt to attach a photo with these points circled. Any current updates since this post???? Does anyone know of what tool Remington intended you to use on gas compossation value caps to remove them ? Need help on how to remove compensation plugs to clean piston and housing. Have applied liquid wrench, hairdryer heat, tried vice grips and adjustable wrench, cannot budge either plug. Tried with a heavy duty punch and broke the tip of the punch. Any ideas appreciated. Had called Remington customer service and was advised cleaning wasn't necessary even though owners manual describes how to do it. Thanks.